I attended a meeting recently and saw something different as I entered the room. 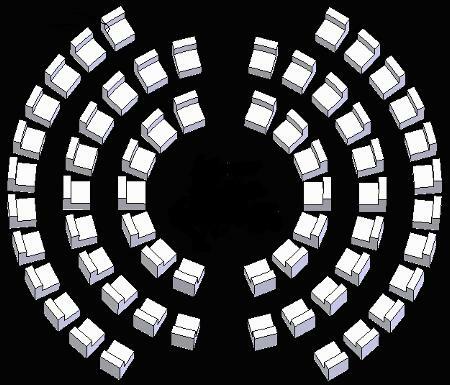 Instead of the typical long rectangular conference table there were just chairs arranged in rough circles, one within the other (see illustration below). Immediately I knew this meeting was starting well. As leaders we can not dismiss the importance of room layout for group discussions (a.k.a. the dreaded business meeting). I learned this lesson from my days as a corporate trainer: step into the circle to maximize your communication. Why is this communication approach effective? It starts with visibility. all eyes and ears are focused on the center of the room and guess what, you are it. There is room to move within the central area and you should use it to your advantage. Walk and get closer to folks as you speak and they speak. Work to channel the conversation to others by moving across the floor to the other side. Control the energy of the conversation. By standing in this middle ground you remain the central entry and can, by movement, engage different parts of the room. Establish a level of equality. There is a level of equality with these circular room seating arrangements. Think of the Knights of the Round Table. Think of so many native people who typically talk in a circle. All have a voice and can join the conversation. As the leader, you start in the center and can invite others to take the space to speak as well. Establish deeper discussions and even dialogue. Your intention may be to reach a specific decision in your meeting or it may be to assure your message is heard as the leader. Your intention may instead be to gather a group to talk about an issue and see where the discussion takes you. This can be a full dialogue with a suspension of outcome and working together to discover. The circle is nearly a requirement for this level of communication. Enhance your presence. All of us have “presence” of different sorts. As leaders we need to work out our best expression of our own unique presence. This presence serves us during these discussions in business meetings or other gatherings. With a meeting circle you have a platform to show and use your presence. In general this is enhanced by standing and moving vs. the traditional seated behind a table. This circle room arrangement requires the speaker (leader) to stand and move. Years ago I was conducting a presentation skills class. In those days we typically set up a U Shape table and chair arrangement for our meetings. Each of the students I taught never broke the apparent force-field that was at the entry of the front of the U Shape table setup. I worked to convince them that their message and interaction with the audience would be enhanced if they broke the seal and stepped “into the U”. As folks tried it as we ran practice presentations, they commented afterwards that they felt the difference. They connected more; they showed off their own unique presence; they controlled the room energy and most importantly, they were heard. I have mentioned it before that humanity has forgotten more than it has learned. Add stepping into the circle as something forgotten by modern society. Native Peoples know this power and many of our teachers today understand it too. Pull people or students into a circle and let the communication flow. If you work in a business environment even a highly corporate environment, I bet you can find opportunities to get the right room and forget the tables. Arrange the chairs into the circles and when ready … step into the center and be the leader. We keep moving folks, moving together. Something fairly simple with a large impact. I hadn’t really thought of this, especially in to this level of detail. Interesting read! Thanks – yep the central focus and setup is important and enduring. I love the setup for British Pariament with the central area for their speakers. Hey, the Star Wars Jedi council is a circle too. I was in a meeting today and the attendees were asked to insert some tables into the otherwise conventional (read: row upon row of chairs in a typical meeting room/lecture hall style) room set up. People were asked to put about 6-8 chairs around each table. Immediately, one of the attendees grumbled: “Oh, this is going to be one of those ‘active participation’ meetings, huh?” It amused me, because yes, this was going to be an active participation meeting. It’s amazing the impact that physical room set up can have on the environment and mind set of people just entering the room! Thanks for stoping by. Great line – an active participation meeting. How silly of us. Structure is important and yep time to move the tables and the chairs! Keep focused on making a difference.